Inglis volunteer, Robbie Shell, wrote a beautiful article for The Wall Street Journal - and mentions Inglis. We are honored to have committed volunteers who see “beyond the chair” when working with people with disabilities. The message in the article not only holds true about the 250 residents of Inglis' long-term care community, Inglis House - but for the more than 1000 people with disabilities whose lives Inglis touches each and every day throughout the Greater Philadelphia Region. 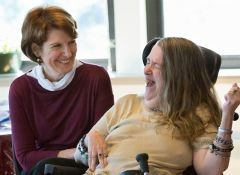 Pictured: Robbie Shell (L) along with Patricia Price (resident at Inglis House) share a laugh during a recent visit.